Avoiding costly downtime on commercial projects due to tire failures has never been more important. Just one tire failure on your equipment can throw an entire project off schedule while adding significant costs and delays that could have been avoided. In addition, maintaining proper tire pressures on your equipment will help to significantly increase the life of your tires, optimize the traction and performance while creating a smooth ride for the operator. The new Doran 360CE™ Tire Pressure Monitoring System is designed to handle the rigors of the harsh environments at construction sites, mines (surface and underground), quarries and terminals/ports to provide accurate and reliable tire pressure readings on your commercial equipment. 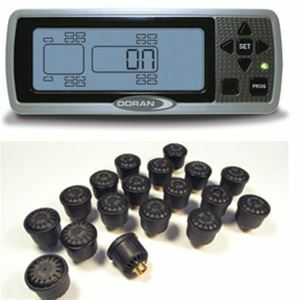 The Doran 360™ Tire Pressure Monitor Systems have raised the bar and set the standard for the Truck Fleet, RV/Motorhome, Mining/Construction, Motorcycle and Bus markets. Under-inflated highway tires increase rolling resistance, increasing fuel usage. Catch those tires sooner!